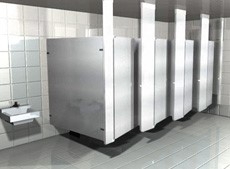 Bathroom partition dimensions are critical when preparing to order materials for commercial restrooms. A little planning will make sure your installation process is smooth and flawless. Commercial partitions will sometimes require a custom layout. Custom layouts are not anymore expensive, however, they are not as common as a standard 3’ compartment. Your layout dimensions need to be precise when having a company quote your restroom partitions. This is because most bathroom partitions cannot be cut in the field when installing. This would damage the partitions unless the material is solid plastic. Common partition material is like a plastic cutting board you use in your house. Some materials use a honey comb cardboard on the inside for support with two sheets of steel on the outside. This would be very hard to cut and could cause issues to the partition. A simple overhead layout is the best route for all toilet partition quotes. The layout should include where your tiled walls are, as well as, how wide and deep the compartments you want them to be. 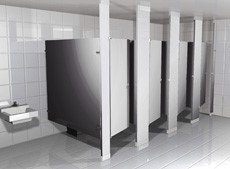 Standard toilet stalls are 36” wide by 60” depth. 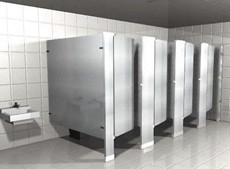 Partition stalls can have a minimum depth of 48” in most cases or up to 78” depth if needed. You want to make sure you are measuring exactly where the partitions will be placed, because bathrooms are not always exactly square. 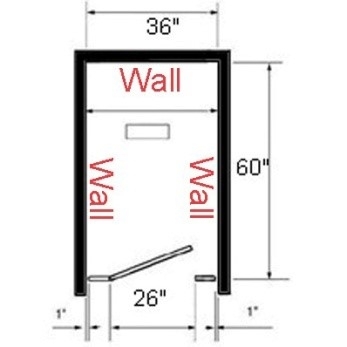 For ADA Handicap compliance compartments, all new construction must have out swing doors with no more than 4” from corner diagonally to the toilet with 18” center from the nearest wall or partition. The minimum dimension is 60” wide on the inside by 59” deep also on the inside. This also would need to be a 36” door which a wheel chair could fit through. 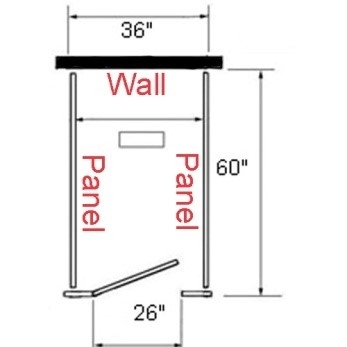 Ambulatory accessible compartments are 36” wide at a minimum and also have a handicap door which is usually 32”. Overhead brace floor mounted partitions are the most common in the United States. This style is an easy installation with no ceiling or special flooring needed. The most economical solution for high traffic areas and overall height is 82”. Ceiling hung partitions are great for easy floor maintenance with a clean and contemporary appearance. Maximum ceiling height is 123.5” with most manufactures. Floor mounted partitions are great for lower ceilings and lower traffic areas. The overall height is 70”. Floor to ceiling braced partitions are the best for high traffic areas such as airports and high schools. Extra support from floor to ceiling. Maximum ceiling height is 122” with most manufactures. 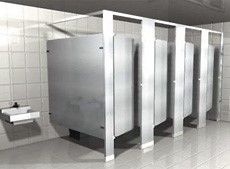 Over size panels and door for extra privacy are also available. 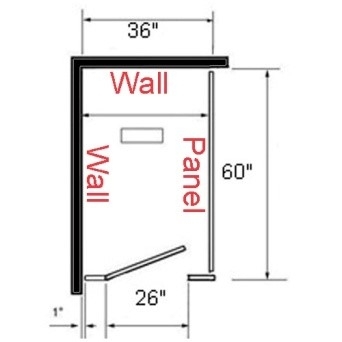 Maximum height for a door is 71-1/2” and panels are 76”. No sight options are also available which include continuous brackets and full length door stops and hinges. Powder coated steel is the least inexpensive and used the most in the United States. There is a standard in the industry with most factories making this product the same way. This product is spray painted on top of steel with a honeycomb cardboard on the interior for support of the doors, panels and pilasters. Plastic laminate is used in commercial businesses and churches with less traffic. The laminate usually comes from Formica or Wilsonart and is adhered to particle board on 6 sides. This is a high pressure process. Solid plastic material is a high density poly ethylene that is made to last for 30 plus years and is very durable and moisture resistance. These days they are used in high schools, pool restrooms and more. Stainless steel has a brilliant smooth surface type 304 with #4 brushed stainless steel finish. This product is great for easy maintenance and used in airports, high end restaurants and more. Solid phenolic comes in black core and a color thru option. The black core uses a laminate for the two face sheets and the four edges are black. The color thru is similar to the solid plastic, but is a very smooth texture. Show where the walls are. How wide and deep the compartments are. 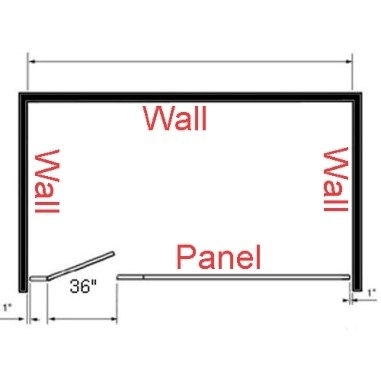 Overall dimension for between walls. Optional toilet bowl centers for better visual. If not sure we can fill in the blanks. What style bracing? Most common Overhead braced. We send all customers detailed drawings for approval. All quotes include all necessary hardware and brackets to complete the job.